With little known about Northern Saw-whet Owl (NSWO) breeding ecology in Virginia and as a Species of Greatest Conservation Need in the Virginia Wildlife Action Plan, the subject warrants investigation. We hypothesize that NSWO are breeding in the spruce forests of Southwest Virginia. Our project will answer this question by thoroughly surveying potential breeding habitat. We will conduct audio playback surveys 4 times at 29 sites through the breeding season. The Northern Saw-whet Owl (NSWO) is a rarely seen species primarily inhabiting northern boreal forests. A relic sub-population persists in high elevation refugia scattered among the Appalachian Mountains, including areas of Virginia. Due to its small range and secretive nature, much of this species’ life history remains a mystery in Virginia. This project will focus on answering the questions associated with the breeding ecology of this typically northern species. During the breeding season, NSWO are their most conspicuous with regular calling between late March and mid-June in the southern Appalachians. We will focus our efforts during this window to find out if NSWO are still breeding here and to delineate the breeding territories across the high country of our region. Southern breeding populations of NSWO are limited to spruce-fir forests. This forest type is one of the most threatened ecosystems in the southeastern US. In our project area, this habitat only occurs on the highest mountains (>4000 ft). Historic logging, chemical deposition, and invasive species have caused drastic declines of this forest type. At present, climate change looms as an additional threat - likely increasing the elevational restriction and further decreasing available breeding habitat for NSWO. Our research will delineate any current NSWO breeding habitat and contribute greatly to the understanding of population densities which will be crucial for monitoring NSWO into the future. Our primary goal is to determine if NSWO are still breeding in the boreal forests of southwest Virginia. We will answer this by using a standardized audio playback protocol for NSWO. Due to the quality of the habitat within the area, it is likely that breeding is occurring. Our project will answer this question. The funding will allow us to survey the likely habitat with repeat visits to the same points throughout the breeding season. This level of effort will result in a clear understanding of NSWO use of the potential breeding habitat. If we are able to document breeding, our next goal is the delineation of breeding territories. This will be crucial for future conservation measures for these owls. The digital playback equipment will be weather resistant and durable self-contained players and speaker combinations to simplify the acoustical surveys. Two of these devices will allow for two field crews to increase the efficiency throughout the short survey window during breeding activities. With the funds for a field technician we will be able to give this project enough effort to get a much clearer picture of breeding, breeding success and densities of the birds in the areas of detection from 2018. We will be able to repeat surveys along routes throughout the breeding season which will better document breeding activity and likely increase our detection rates of these elusive birds. Relatively little is known about the breeding distribution and ecology of the Northern Saw-whet Owl in Virginia, despite its high priority status. 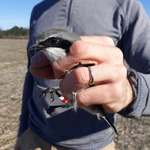 This project is a great first step in gathering much-needed data that is critical to evaluating the species’ status and conservation needs, and I hope that it can be expanded to cover an even broader geography in the future. Jay Martin is a vastly capable wildlife biologist with prior experience working with this species - please support this project and help put the Saw-whet Owl on Virginia’s map! During the breeding season, NSWO are their most conspicuous with regular calling between late March and mid-June in the southern Appalachians. We will focus our efforts during this window to reveal the breeding locations of NSWO across the high country of our region. Regular calling occurs between late March and mid-June in the southern Appalachians with a peak in spontaneous calling from mid-April to late May. 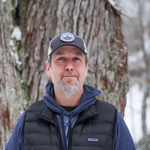 Jay is Blue Ridge Discovery Center's connection with public land managers and academia. He is responsible for implementing wildlife projects and internal research as well as fostering land management and research partnerships. Having served 17 years as a wildlife biologist with the US Forest Service, he has studied a broad range of taxa including fish, reptiles, amphibians, birds and mammals. He draws on his land management and collaboration skills to successfully build partnerships within the Blue Ridge. He studies and shares his observations of nature while engaging the community in citizen science and by presenting results. By taking this approach to research, he fosters curiosity, discovery and stewardship in participants through the wonders this biologically rich area provides. Mapping of Survey Points Across NSWO Habitat is Complete. With our mission to inspire curiosity, discovery, and stewardship through the wonders of the Blue Ridge at the forefront, we also prioritize local engagement with our research. As a charismatic representative of the high elevations within the southern Appalachian Mountains, the Northern Saw-whet Owl is a perfect ambassador to highlight the unique ecology of Southwest Virginia’s Blue Ridge. With this project, we will foster a citizen science approach to the monitoring by inviting students and community members to be involved in the research to increase the local understanding and appreciation of this unique species and the biodiversity of the Blue Ridge.